K Couture is your personal, online boutique offering you an extensive selection of eye-catching dresses that are comfortable, customizable and at a great price. Plus, your dresses will coordinate with our line of menswear styles and elegant accessories. Be creative, mix, match and alter many styles to fit your wedding day or special occasion perfectly. Best of all, we’ll ship directly to you! You’ll look fantastic, feel amazing and have peace of mind knowing you stayed within your budget! Our dresses are created here in the USA—so you’ll receive quality, American-made styles that are designed to your unique preferences. Shipping is free for most items. Our online shopping is easy and secure. Plus our friendly customer service team is only a phone call away. We love to hear about your wedding plans and other occasions so we can help make your day special. If you’re looking for something different—no problem. Call us and one of our fashion consultants will be happy to assist as you choose your favorite fabric, color, sleeve style, neckline and waist trim. Imagine being able to build your designer dress without the designer cost. It’s all included. Just tell us what you want and we’ll create your dress together. Call 1-855-612-5426 and let’s get started. Do you have dresses that fit my unique body type? Yes. Our design options allow you to modify our styles to fit your vision so you and your wedding party will look fantastic and feel comfortable. We offer dresses to flatter all shapes and sizes. Plus sizes are available in some styles up to 34. We’re always proud to deliver on our promise of providing an exceptional fit for all. Can I design a dress with menswear to match? Definitely. You can interchange sleeves, necklines, fabrics, waist trims and colors to create the dress you desire using our Design-A-Dress page. Once you decide on your desired look, you can head over to our menswear section to find coordinating looks. We keep it simple and ensure that the menswear matches the dresses! Where does K Couture make its apparel? USA. We make-to-order our dresses and some menswear accessories at our Arizona headquarters using superior quality fabrics and embellishments. We sew quality into every dress you order. Why did you create K Couture? I’ve always loved creating beautiful dress designs. Having grown up in the fashion industry, some say it’s in my genes. And when I was recently planning my own wedding, I learned how challenging it was to find the perfect bridesmaid dress. Then it clicked and I was inspired by an idea: Why not create stunning dresses that women would want to wear over and over again? That’s how we began. Call us at 1-855-612-5426, Monday to Thursday, between 8 a.m. and 3 p.m. and Friday from 8 a.m. and 1 p.m., Pacific Standard Time. What makes one dress cost more than another? It all depends on the type of fabric and color you choose. Fabrics, such as chiffon, are typically more delicate to handle than others. A slightly higher price simply reflects the extra care and precision that is required to create your perfect dress using more complex fabrics. Once your order is placed, you’ll be directed to a secure checkout screen to complete the purchase using your American Express, MasterCard, or Visa credit card. How do I complete my purchase using a coupon or voucher code? During checkout, you’ll be asked if you have any coupon or voucher codes. If you have one, enter the code and your shopping cart will automatically apply the discount. Sales tax is calculated during the checkout process and is based on existing local, state and federal laws. Taxes will be specified in the checkout screen prior to submitting your order. I’m worried about the fit, how do I know which size is right for me? K Couture fashion consultants can help you choose the right size. Once you decide on a style, please refer to our step-by-step instructions on how to measure. If you have additional questions, please call us at 1-855-612-5426 and we’ll be happy to answer them. Does K Couture perform alterations? K Couture does not perform alterations. Each dress is made to order according to our standard sizing charts. 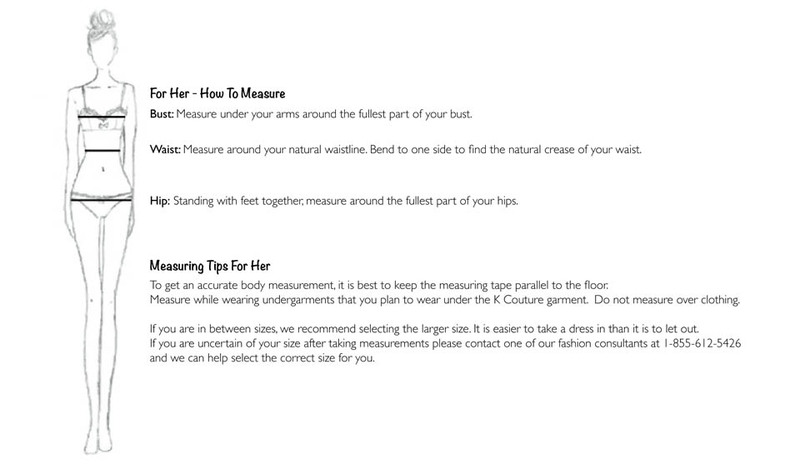 We use your measurements to match the best size for your body. Do you carry other sizes than shown? Can I get my dress with extra length? Yes. K Couture offers alternate sizes and floor, knee or tea length. Call us at 1-855-612-5426 and a friendly fashion consultant will discuss different sizing options with you. What if I like a dress, but I want another fabric, sleeve style, or neckline style? We want to be sure that you receive the exact style you desire and will love wearing. Did you see a satin dress, but prefer it in another fabric? How about a sleeveless dress, but one of our sleeve options is more the look you were hoping for? In most cases, we can customize your perfect dress! Before you order, call us at 1-855-612-5426 and we’ll discuss your many options. Please Note: Custom garments are original dresses or gown designs that are changed at the request of the customer. Custom garments cannot be returned or exchanged. Our order and shipping systems are specially designed to complete your order quickly and efficiently. We’ll begin processing it just as soon as it’s placed. Therefore, we cannot change, cancel or modify orders once they’re confirmed. This includes product, payment and shipping changes. I need to receive my order sooner—do you offer a rush service? Of course! All of K Couture’s styles will ship in 6 to 8 weeks. If requested, we can rush manufacturing dates or shipping methods for an additional fee. Please contact one of our friendly fashion consultants at 1-855-612-5426 to find out more about rush ordering. Can I order my dress by phone? Yes. Please call one of our friendly fashion consultants at 1-855-612-5426. We can answer any questions and place your order immediately. Yes! The first 4 fabric swatches are completely FREE! Additional swatches can be ordered for $2 per swatch. We want you to be confident that you’re getting the exact color and fabric you desire. We’ll even ship it to you via USPS at no additional cost. Visit our K Couture homepage and select, "Contact Us for Color Swatches," then "Order a Free Swatch Sample" to choose your colors(s). What is my recommended order by date? What if it’s passed? Our dresses take 6 to 8 weeks to manufacture, so please plan accordingly. Keep in mind that you may need to make additional alterations after receiving your dress. If you’re in a pinch, we offer rush orders at an additional cost. Please contact one of our friendly fashion consultants at 1-855-612-5426 for details. Can strapless dresses be ordered with straps? We have countless options for all of our dresses and would love to discuss them with you. Please contact one our friendly fashion consultants at 1-855-612-5426 for details. Items that need to be manufactured will ship in 6 to 8 weeks depending on the time of year. Transit time is approximately 1 week. Rush shipping options are available upon request. Call one of our friendly fashion consultants at 1-855-612-5426 for details. Please Note: We offer a variety of items that will ship within 2 to 3 business days. FedEx Ground Shipping does not deliver to residential addresses on Mondays, but may deliver on Saturdays depending on your area. FedEx 2Day and Overnight shipping do not deliver on Saturdays. FedEx will automatically send an email with your tracking number once your order has shipped. If for some reason you don’t receive an email with the tracking information, please contact us at 1-855-612-5426. We’ve got a few options to fit your schedule and pricing. FedEx Ground shipping is FREE within the continental United States. For residents of Alaska, Hawaii, Guam, Puerto Rico and Canada—please call us at 1-855-612-5426 to discuss shipping methods and fees. For all other countries, contact the number above for separate shipping options and fees. We do offer two additional shipping methods to expedite your order if you prefer. Choose FedEx 2Day for $25.00 and FedEx Overnight for $50.00—as long as you’re shipping within the continental United States. Fabric swatch orders are always shipped FREE using USPS. Exchange orders are sent via FedEx Ground for $15.00 per customer order. Additional shipping options are available. If you’re concerned about the security of your package being left at a residence—we recommend that you ship your item(s) to a business address. Please Note: Packages marked as undeliverable by FedEx and returned to K Couture will be reshipped at the customer’s expense. What is K Couture’s return and exchange policy? All of our styles are made to order, which means that your item(s) are manufactured once the order is placed. We ask that you choose a size from our size chart, based on your own measurements. Feel free to call or to email us your measurements and any questions you have. This will help us verify that the best size is ordered for a particular dress. Since each one is made upon request, we’re unable to accept returns on our dresses. In addition, if you decide to cancel your order a re-stocking fee will apply. However, we will accept exchanges for different sizes. All exchanges must be completed within 15 days and may not have been worn, washed, altered or damaged. And they must be clean and free of lint or hair. Garments must have their tags intact and attached. Items that do not meet these conditions cannot be exchanged and will not be accepted. A 30% restocking fee applies to all exchanges and cancellations. Customers are responsible for shipping items back and for shipping charges on an exchange order ($15 minimum for FedEx Ground). The 6 to 8 week manufacturing timeframe still applies to exchange orders. Custom garments cannot be returned or exchanged. If you are uncertain as to, what makes a garment custom please call us at 1-855-612-5426 and one of our friendly stylists will be more than happy to answer all of your questions. Coats, pants and shirts come with a 15-day exchange policy. All returns and exchanges must be completed within 15 days and may not have been worn, washed, altered or damaged. And they must be clean and free of lint or hair. Garments must have their tags intact and attached. Items that do not meets these conditions cannot be returned or exchanged, and will not be accepted. A 30% restocking fee applies to all exchanges and cancellations. Customers are responsible for shipping items back and for shipping charges on an exchange order. My dress arrived, but was damaged during the shipping process—what should I do? It rarely happens, but in the event your order is damaged, please do not hesitate to call us at 1-855-612-5426 right away. We’ll work together to resolve the issue expediently. When I make a purchase, is my personal information safeguarded? How can I be assured that the color resolution that I’m viewing on my computer screen matches the fabric I want? Fabric colors may vary slightly depending on your computer monitor and its resolution—so we recommend that you order one of our color swatches. You’ll be able to touch, feel and see the fabric before placing your order. And your first 4 swatches are FREE and so is shipping! Needless to say, our customers love this added level of service. Please note that we cannot gurantee dye lots. There is a chance hues may differ slighty.